This is a magnificent walk with lots of everything: forest - lapiaz, high pastures, a pleasant crest, a summit, and a little bit of scrambling. It shouldn't be missed. The time given is on the generous side, as you won't want to rush it. The route starts (map) by ascending the obvious weakness in the cliffs to the left of the centre of the cirque. The grass on the horizon in the photograph is the col for which we are heading, and is the start of the Alpette pastures. It marks the line of a prominent geological strike-slip fault that cuts through the massif. Find your way into the centre of the hamlet, either by following the road, or preferably by following the footpath that cuts out the bend in the road. A sign post indicates the routes to the Grotte-Colon to the north, but our route ascends to the east towards the cirque wall. It is well route-marked, being part of the GR9. The stony track ascends steeply between two pastures. At the top of the pastures, as the path enters the forest, an alternative, and newer, track leads off half-right. They both join up again a few hundred metres, but the latter is to preferred as being less stony, and easier on the feet. The track ascends through the forest, in a somewhat uncompromising way, but after half an hour you will pass close to the base of the cliff, and half an hour after that you will reach the col de l'Alpette (1547 m) at a fence, with a synclinal valley before you. This is indeed a beautiful spot, with high mountain pastures in front, the other side of the valley rising steeply to the crest with tree-covered lapiaz, and high cliffs protecting the continuation of our crest to both the left and the right. The grassy path ahead leads towards the bergerie and refuge located three hundred metres away, but the sign post at the col indicates clearly that we should take the more obvious, left hand path. This takes a line just above the valley, and under the barrier of cliffs protecting the way on to Mont Granier. However, if you prefer, follow the valley itself in a parallel direction, passing a useful spring after a couple of hundred metres. Don't worry about following a path - we are making for the general direction of the two giant boulders on the horizon. About level with the pair of giant boulders the path starts to ascend towards the cliff. This splendid path traverses above the valley, occasionally surmounting a rocky step, until it ascends a line of weakness through the cliff. This is very steep at first, but some useful iron hand rails and footsteps help you to overcome the harder sections (Grade 2). The path continues up, and then traverses round to enter the upper Granier basin. From here, the summit is still a couple of kilometres away, across a wilderness of forest, cliffs, and lapiaz. The route is well marked, and traverses around the basin below the crest. The views over to the Belledonne range are outstanding. Take note of the col between the south and north summits, for this is where the route from the Grotte Balme à Colon arrives at the ridge. Eventually, the path takes you up onto the crest. This is a splendid section with outstanding views in all directions. The summit, surmounted by a small cairn, is reached in under three hours. 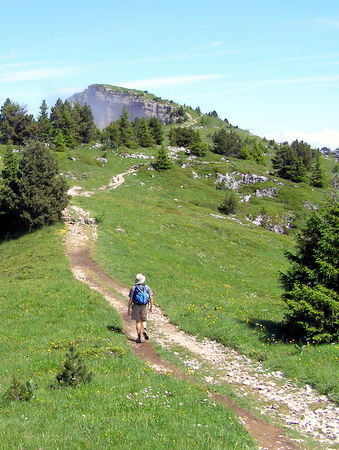 Although the views are stupendous, it is well worth continuing for a further 300 metres to the Cross of Granier. This is situated dramatically on the edge of a buttress right at the corner of the northern cliffs. Behind, you can see all the way down the Vallée d'Entremont to Chamechaude; ahead may be seen the town of Chambéry spread out, and the Lac du Bourget; and to the east the Alps disappear into the distance. On a clear day, the Mont Blanc range looks close enough to touch. Although you can descend via the Grotte Balme à Colon, this is not particularly recommended, being better as an ascent route. However, you will not be disappointed if you retrace your steps, especially if you take a little time to explore l'Alpette en route. Allow a couple of hours.